Grainy Library of Congress reference copy of contact sheet chronicling Scott demonstrating one of his electronic gizmos to then-wife, singer Dorothy Collins, at their Long Island home. Year unknown, but likely mid-1950s. Judging from the slanted ceiling, the monstrous machine appears to be installed in their attic. Whether it was built or hauled up there is an intriguing question. The device could be an early version of the Electronium, Scott's "instantaneous composition-performance machine" which he developed in the 1960s. Whatever it is, the magnificent instrument no longer exists. Addendum (28 July 07) Jeff Winner of RaymondScott.com adds: I included another (presumably earlier) version of this device on page 23 of the book accompanying the Manhattan Research CDs. Same room, same piano bench, same shirt & haircut. I have another pic of this instrument, but neither RS nor DC are in the frame. I've been hoping that sooner or later we'd find a photo of this device with some info written on the back, or a caption in an old magazine that would explain more detail, but I've had no luck in that department. Yet. 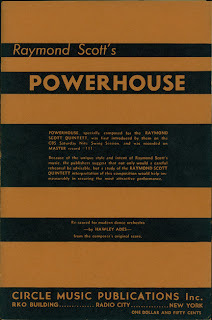 "Powerhouse" is arguably one of Raymond Scott's three best-known works, along with "The Toy Trumpet" and "Mountain High, Valley Low" (from the 1946 Broadway musical Lute Song). 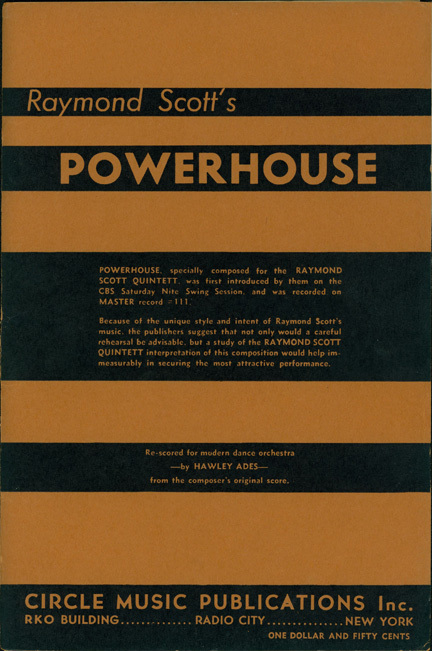 First recorded by the Raymond Scott Quintette in 1937, "Powerhouse" was covered by dozens of orchestras and small jazz combos worldwide in the following decade. 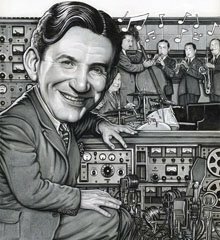 In 1943, Scott sold his publishing rights to Advanced Music, a division of Warner Brothers, and that year Carl Stalling began peppering his Bugs Bunny and Daffy Duck cartoon scores with Scott melodies — "Powerhouse" being the most oft-quoted. Once the publishing belonged to WB, Scott had no further involvement with licensing, other than to collect writer's royalties. He surely had nothing to do with the use of his melodies in Looney Tunes. 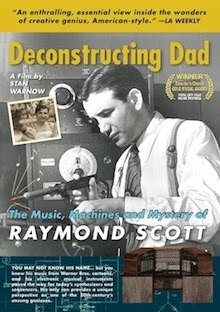 There is no indication that Scott and Stalling ever met, or that Scott was even aware of Stalling, though Stalling was certainly hyper-aware of Scott's music. There's more info about "Powerhouse" at Wikipedia.